Be sure to visit the “video” page and the “Images” page under the “media” link for some amazing images and video! The importance of lush understories composed of forbs, weeds, grasses, and legumes can not be understated for wildlife management. Pine woodlands are especially well suited to managing quality understory plants because once set up, they can be maintained indefinitely with regular burning. Although true bottomland hardwood stands are not prime candidates for QVM some mid-slope and upland hardwood and pine/hardwood stands may benefit by clearing thick midstories of low quality hardwood stems and allowing weedy understories to flourish. Degradation of these understories occurs when timber stands are left unmanaged by excluding timber thinnings and/or burnings. Unthinned stands can create tree canopies that completely shade out the understory plants that are dependent on sunlight. Stands that are open enough to allow sunlight but are not burned regularly become thick with low value hardwood saplings and shrubs and eventually shade out the understory plants as well. Traditionally, these habitats have been restored with some combination of thinning, growing season burning, herbicides and clearing with a bulldozer. Thinning, burning and herbicides may take lots of time and patience to achieve the desired goal and bulldozers can leave a mess with heavy soil disturbance and large piles of debris that may take years to get rid of. While soil disturbance can often be beneficial, it is usually better to allow existing perennial weeds and grasses to re-vegetate the ground when clearing these sites. Perennial grasses have deeper root systems and hold soil in place better than the annual weeds that follow soil disturbance. Woodland grinders remove woody debris and unwanted trees while leaving little impact on the soils and the remaining vegetation without leaving piles of ugly, unwanted debris to be burned. With traditional clearing equipment, the surface layer of soil is disturbed which often changes the vegetation structure to tall weedy undesirable plants. The soil disturbance can also lead to erosion. By using a grinder many of these problems are avoided. No piles are created, instead all material is ground into mulch on-site. The mulch acts as another defense against erosion and can even help the soil retain moisture. The lack of soil disturbance also allows grasses like broomstraw, etc to grow on the site without competition from taller weeds. And lastly the lack of ground disturbance does not interrupt your controlled burning regime. 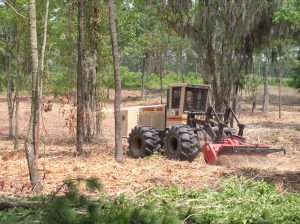 Understory clearing is popular in pine, pine/hardwood, and hardwood stands. While commercial thinning is the preferred method to opening up a stand, often the trees are so overcrowded and/or have so few commercially valuable stems that waiting for them to become “merchantable” may be unrealistic. 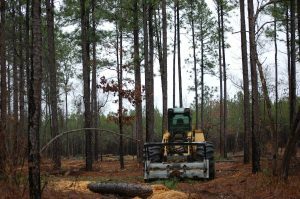 Pine stand renovation (for both wildlife habitat creation and timber growth) has become popular in several forms including herbicide applications in conjunction with burning. This method is particularly useful when the stand has been regularly burned and the hardwood stems are small, but in some cases the low quality hardwoods become too big to spray with ground equipment. When this happens the larger diameter stems can be removed with a grinder and allowed to resprout. After they have resprouted chemicals can be applied and the turnaround time for the stand is reduced drastically. With a trained operator desirable species such as dogwood, blueberry, persimmon, etc. are easily avoided and unharmed with a grinder. 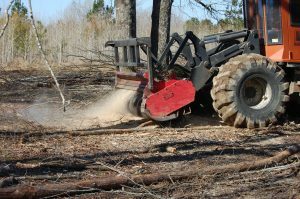 Grinders can be used for cleaning up following a commercial logging operation. There is often a “mess” left once loggers have finished thinning a site. Pre-merchantable (and sometimes merchantable) stems are usually scattered around the site that are leaned over, broken off, tipped up or damaged somehow. We have used these machines extensively on both thinned and clearcut ground to cleanup following loggers. Hourly costs for these machines vary with the size of the head and carrier. Large machines in the 300+ HP may cost as much as $3-400/hour. Smaller bobcat style machines usually run in the $100-130/hour range. Obviously, mid-sized machines would fall between these ranges. Smaller 185 – 225 HP machines runs $190 – 225/hour on most jobs. There is obviously higher productivity and more efficient handling of material with more horsepower, but there is also more maneuverability and nimbleness with the smaller machine when working in heavily wooded stands.